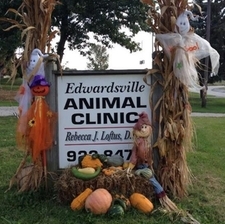 Edwardsville Animal Clinic opened in 2002. Dr. Rebecca Loftus purchased the clinic formally known as Kiesler Veterinary Clinic from Dr. Anthony Kiesler in 2002. Kiesler Veterinary Clinic had been in business for over 34 years. The clinic was remodeled and expanded from 800 sq ft to 2800 sq ft. The clinic has a full service laboratory, ICU treatment area, surgical suite, and a separate boarding and grooming area. Edwardsville Animal Clinic cares for nearly 10,000 canine/feline patients and 200 equine patients. Dr. Loftus offers ambulatory care for the equine patients and makes house calls for small animal patients.